Ostara is the celebration of the vernal, or spring, equinox. It is a time to prepare for the beginnings of new life. The hours of day and night are of equal length, with light overtaking darkness. Ostara roughly corresponds to the Christian Feast of Annunciation, also known as Gabrielmas, or ‘Lady Day’ in England, celebrated on March 25. 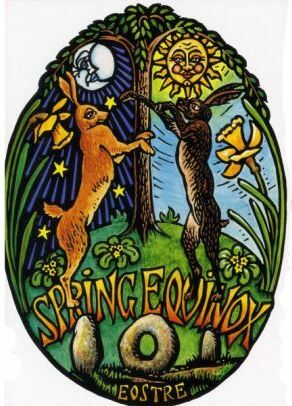 Ostara is also associated with the Christian festivals of Easter, which is held on the first Sunday after the first full moon following the vernal equinox, and Passover, which falls on the first new moon following the vernal equinox. The name Ostara comes from the fertility goddess Ēostre, a Germanic deity associated with the hare and the egg, both symbols of fertility and rebirth. Ēostre is the Germanic name for the month of April, and is the namesake of the Christian festival of Easter. Various mythos surround this holiday. Ostara is a time of new beginnings, fertility, balance, new life, and rebirth. It is a time when the winter turns into spring, the light grows stronger and life stirs once again. As with the light, the forces of masculine and feminine energy are also in balance. In Wicca, it is thought that the young god and goddess grow into the Stag King and the Lady of the Beasts. In one version, the goddess and the god become betrothed and will consummate their relationship at Beltane. However, as Ostara is nine months to Yule, it is also thought that the goddess becomes pregnant at this time. 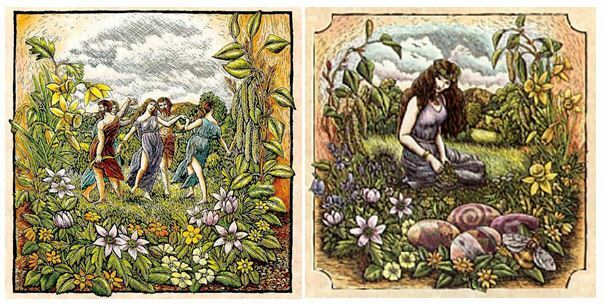 Ostara is a time of beginnings, action, planting, feasting and socializing. It is a time to put your plans from Imbolc into action. Traditional activities surrounding this holiday include egg decorating, ringing bells, lighting new fires.